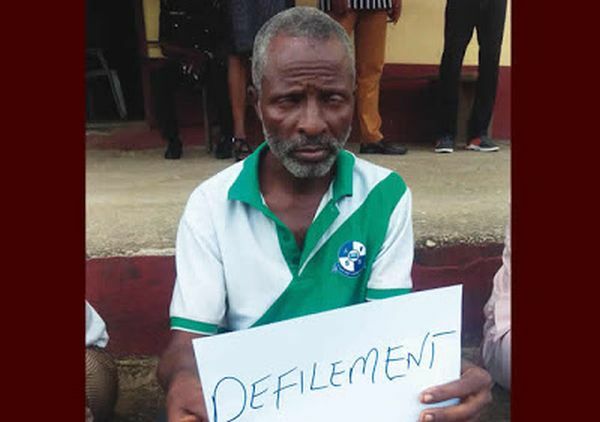 A 52-year-old man, Henry Oboh, has been arrested by the operatives of the Cross River State Police Command for allegedly defiling a 12-year-old girl in a community known as ‘One Man’ in the Akamkpa Local Government Area of the state. Oboh was said to have dragged the victim into his room and threatened to stab her with table knife before having carnal knowledge with her. The suspect, who was paraded alongside other suspects, for various crimes at the state Police Command headquarters in Calabar, said it was some forces that pushed him to commit the crime. Oboh, who could not name the forces, said he never planned to defile the victim, adding that he was ready to face prosecution over the matter. The father of four said he was seriously regretting his action, saying he gave himself up for arrest and investigation because he immediately realised after the crime that what he did was wrong. ““Some forces pushed me to have s*x with the small child. I was not myself and how I did that I cannot explain. I never planned to have s*x with her. Something pushed me all of a sudden and that was why I immediately surrendered myself when the police came to arrest me.